of viral hemorrhagic septicimia, or VHS. barely keep up in understanding the impact on the native environment. Down from almost 50 in the spring spawning run of 2003 to just 4 this year. many adult muskies in their reproductive prime. causing more die-offs of one of America’s most prized freshwater fish. species that are causing problems in the lakes. For the Great Lakes Radio Consortium, I’m Tamar Charney. The invader was captured this July. The tubenose is related to the round goby, whose population explosion across the Great Lakes has scientists concerned. Round gobies eat contaminant-laden zebra mussels, and then pass those toxins on to sport fish favored by humans. But Jeff Ruetter, director of Stone Lab, says the tubenose goby actually first appeared in the Great Lakes two years before its cousin and so far, isn’t widespread. Ruetter says the appearance of the new invader underscores the need for tighter controls on exotic species. For the Great Lakes Radio Consortium, I’m Karen Schaefer. 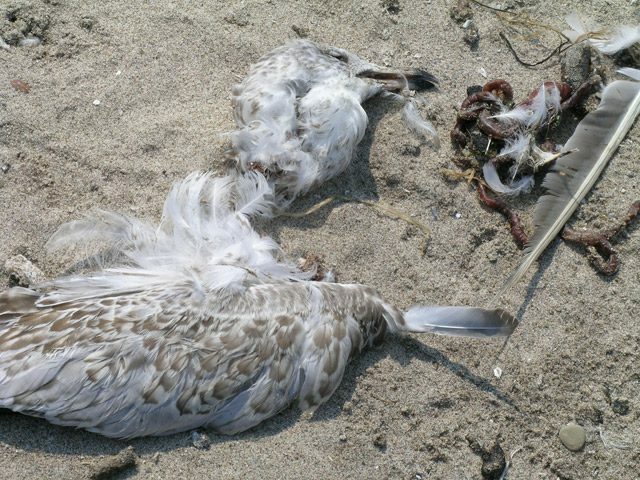 Alewives washed up on Lake Michigan shores after the invaders' populations exploded, then crashed. Researchers have a difficult time predicting how invasive species will affect the balance of nature in the Great Lakes. Ever since the Great Lakes were opened to shipping, exotic species of aquatic animals have invaded the lakes. Nearly always it’s been bad news for the region’s native fish and wildlife. The Great Lakes Radio Consortium’s Lester Graham reports on the latest effects of the invaders. Lakes have been around since the 1940’s and ’50s. For example, the sea lamprey found its way into the lakes through manmade channels. It’s a parasite that attacks lake trout and other large game fish. It devastated the lake trout fisheries. Only recently have efforts gotten the lamprey under control. It’s still out there, but it’s not decimating the lake trout population as it once was. More recently, a big concern has been the zebra mussel. It hitchhiked its way to the Great Lakes in the ballast water of cargo ships. In the last couple of decades the zebra mussel has caused major changes in all the lakes except for Superior where it seems limited to the shallow and warmer bays. 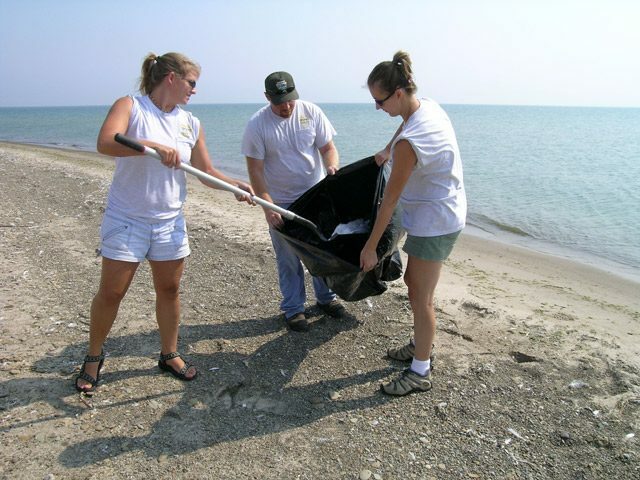 Great Lakes and Aquatic Sciences. He says the huge numbers of zebra mussels siphon through lake water like a giant network of filters. There are so many of them that water in the lakes is actually clearer. Things such as, algae converting the sun’s energy into more phytoplankton. Small fish and tiny invertebrate animals called zooplankton eat the phytoplankton and then they become food for fish. But, the zebra mussels filter out a lot of the phytoplankton, stealing food from the native zooplankton. David Jude says a couple of other invaders are also causing havoc at the base of the food chain in the Great Lakes. Instead of eating just the green phytoplankton, zooplankton invaders from the Black and Caspian Seas also eat their North American cousins. Besides the zooplankton floating around in the water column, a major food source for fish is in the sediment at the bottom of the lakes, and it’s disappearing. James Kitchell is with the University of Wisconsin – Madison. He says many different kinds of fish depend on a little creature called diaporeia, which have become scarce in many areas. 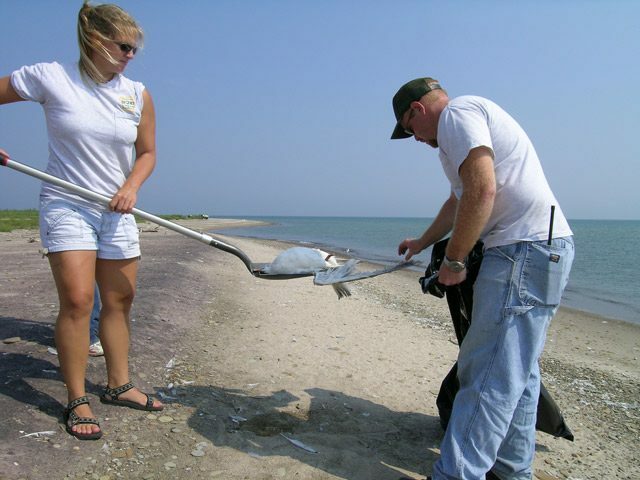 It’s a big concern because a lot of fish that anglers like, such as yellow perch, depend on diaporeia for food. Besides the zebra mussels and the two zooplankton predators, a fourth invader is causing problems. Populations of the round goby, an ugly, aggressive feeding little fish from Eastern Europe, have exploded in the Great Lakes. The round goby scours the bottom, eating the eggs and larvae of native fish. 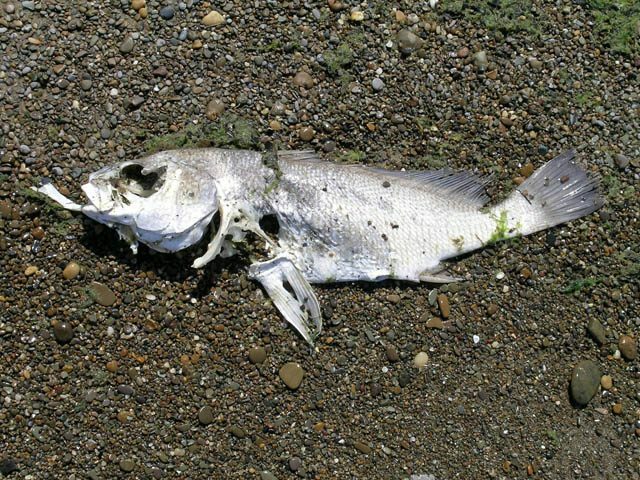 The University of Michigan’s David Jude says as big of a problem as the invasive fish has been over the last several years. The round goby’s future might soon be curtailed a bit. Other native fish are beginning to eat the exotics. The silver chub, which once nearly disappeared from the Great Lakes, is making a bit of a comeback feasting on zebra mussels. With each invader, the lakes ecosystems go through upheaval, and then find a new balance. But make no mistake. It’s a different balance. Nicholas Mandrak is a researcher at Youngstown State University. 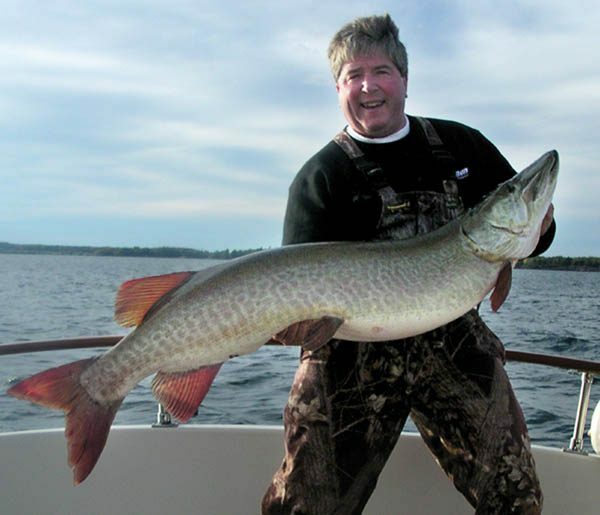 He says exotic species invading the Great Lakes will mean continued changes, and for people who fish the lakes, not many of the changes will be good. 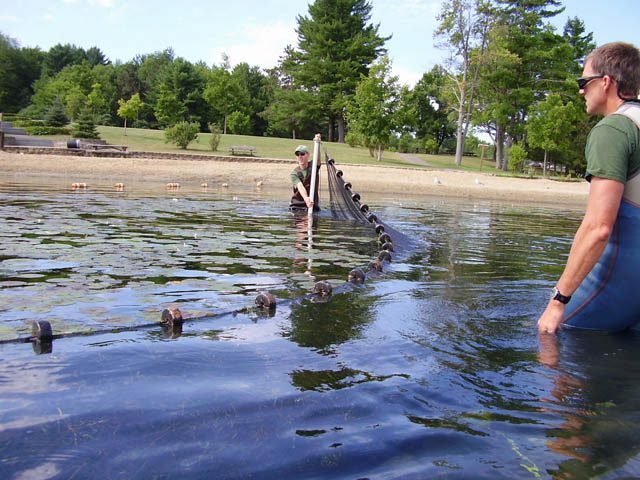 Researchers, though, have learned to be careful about predicting how invasive species will affect the lakes. They’re often surprised by the intricacies of the food web and the ecosystems that support it. Throwing an exotic invader into the mix makes it that much more unpredictable, and it will likely get worse. Mandrak says they’ve been studying how global warming might affect the lakes. One scenario suggests 30 to 40 new exotic species from the South will make their way through manmade canals as temperatures rise. For the biologists, it’s a worrisome concept. For the Great Lakes Radio Consortium, this is Lester Graham. It appears that fish native to the Great Lakes are beginning to prey on some of the alien species that have invaded the lakes. The Great Lakes Radio Consortium’s Lester Graham reports. Aquatic Species from Europe and elsewhere have hitchhiked to the Great Lakes in the ballasts of cargo ships for many years. A lot of them have upset the natural ecosystems of the lakes. Lately, though, some native fish are taking advantage of the invaders. Nicholas Mandrak is a researcher at Youngstown State University. He says a Great Lakes minnow that was once thought to have died out has recently re-emerged. Other researchers say small mouth bass are beginning to prey on another invasive species, the round goby, which eats the eggs and larvae of fish native to the Great Lakes. The researchers say the benefits don’t outweigh the negative affects on native species. But it evens the score a little. For the Great Lakes Radio Consortium, this is Lester Graham.